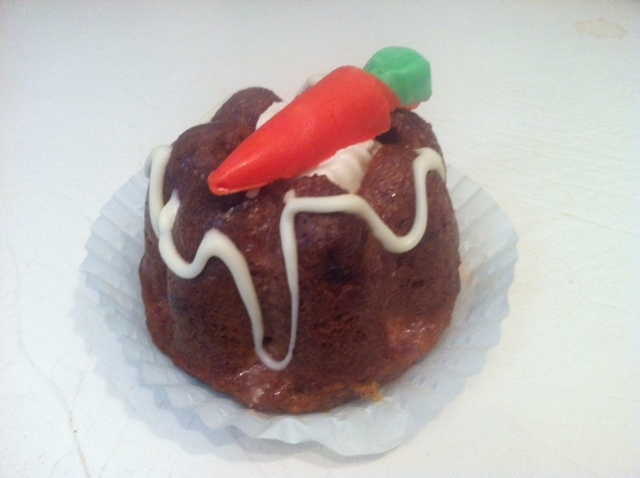 Carrot cake is especially moist because it is made with oil. Oil unlike butter, remains liquid at room temperature, so the cake stays moist even when cool. Your carrot cake can contain walnuts, raisins or even pineapple, to avoid nut allergies I made this one without the nuts and pineapple. The carrots are best when grated on a box grater. Using the smallest teeth on a grater is best, no one likes chunks of carrot in their cake. I used a Flexible mold from Sasa Demarle called the charlotte in this recipe. These flexible molds are great for individual desserts, check it out at http://www.demarleusa.com. They have a wide selection of molds to choose from and best of all they never need a release coating such as oil coating or flour. Preheat the oven to 350 degrees. Butter and flour your loaf pan. In a bowl, whisk together the flour, sugar, baking soda, baking powder, cinnamon, cloves, nutmeg, allspice and salt then sift into a large bowel. In a separate bowl mix the wet ingredients (oil and egg) then stir into the dry ingredients. Stir in the raisins. Transfer the batter into your prepared pan and bake for 30 to 55 minutes or until a tooth pick inserted in the center comes out clean. let cool for 5 minutes before removing from the pans. Rest the loaf on a cooling rack for at least 1 hour. To make the frosting, combine the cream cheese, butter, vanilla and sugar in a bowl of a stand mixer and beat at a medium speed for approximately 10 minutes until smooth. Spread the frosting on the top of your loaf after it has completely cooled. On my carrot cake I removed the center of the molded cake with a cupcake cutter (Made by Wilton to fill the center of cupcakes) and then I filled the center of the carrot cake with frosting. I also made small carrots from colored chocolate for that special eye appeal.